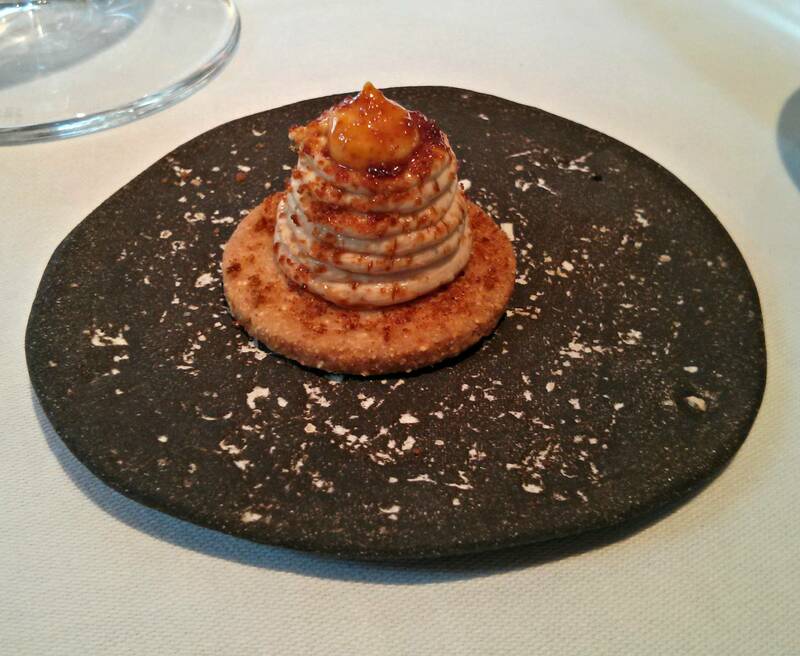 Considered one of the best restaurants in London by many of my peers, and by some notable awards as one of the best in the world, The Ledbury is a Notting Hill based restaurant of some repute. Located near the lower end of Portobello Road market it's a decent sized open room, with large windows by Ledbury Road and mirrored wall at the back. 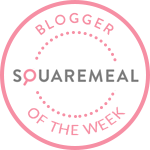 We were seated, chose a glass of rose champagne and offered canapes, curd for my wife and foie gras and orange for myself as browsed the choice of set lunch, a la carte or tasting menus. 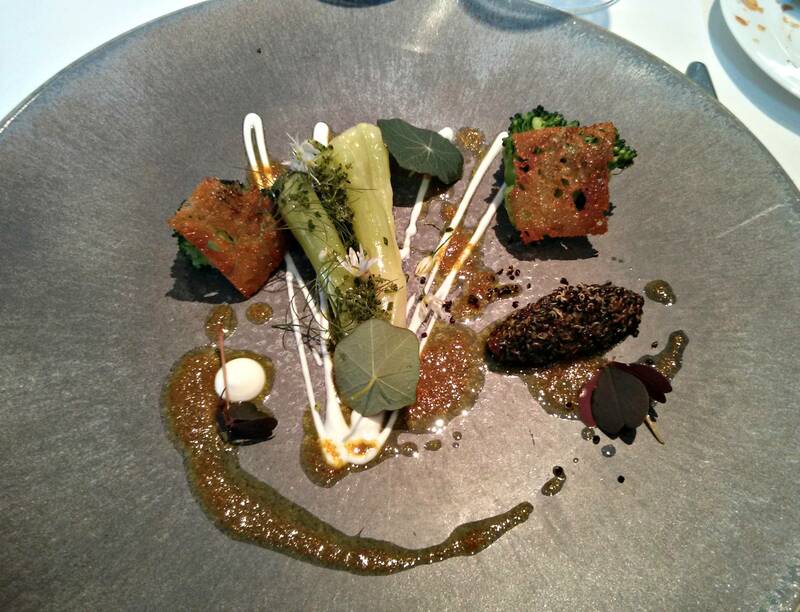 The vegetarian menu could be chosen as courses, or taken in its entirety as a tasting menu. 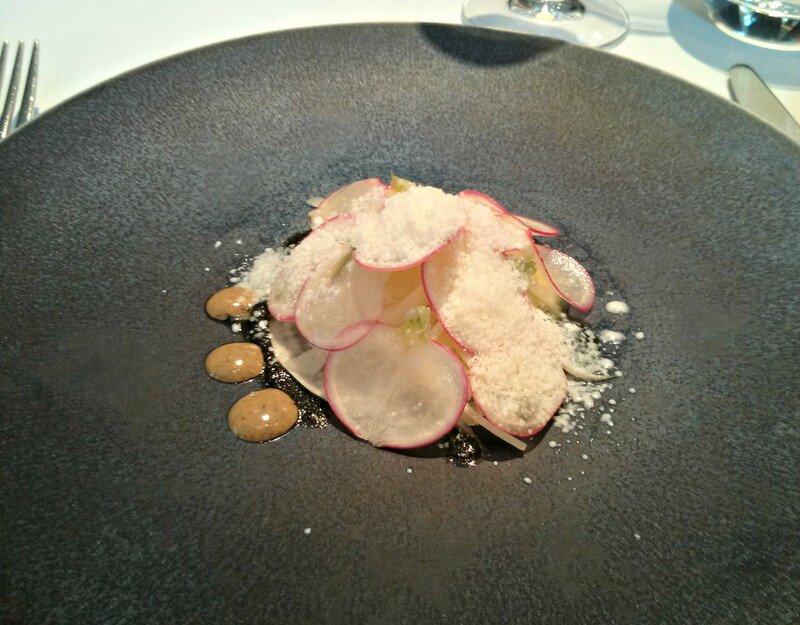 I was keen to sample as much of Brett Graham's cooking as possible so we went for the vegetarian and standard tasting menus. 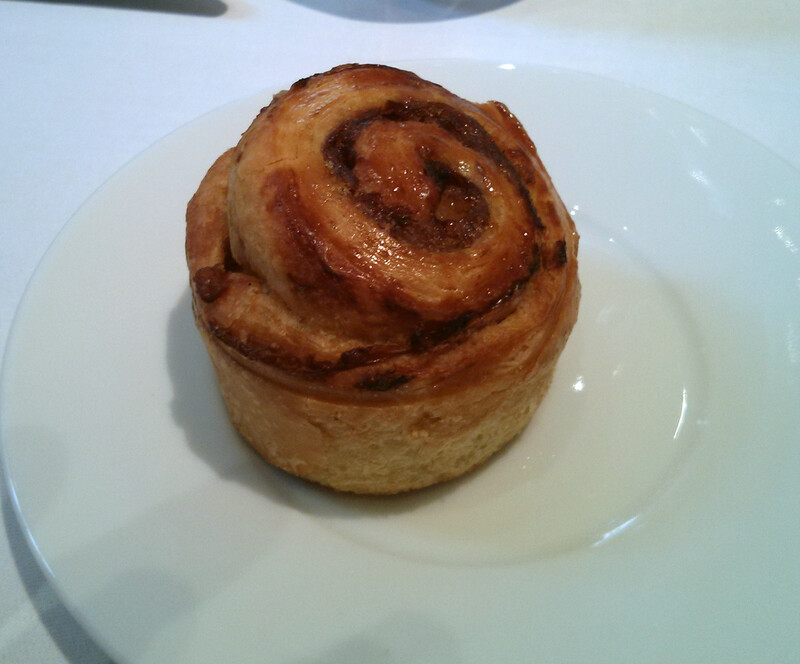 Bread is made in house, my first choice a bacon and onion brioche of extremely high quality, as good as anything I've had. 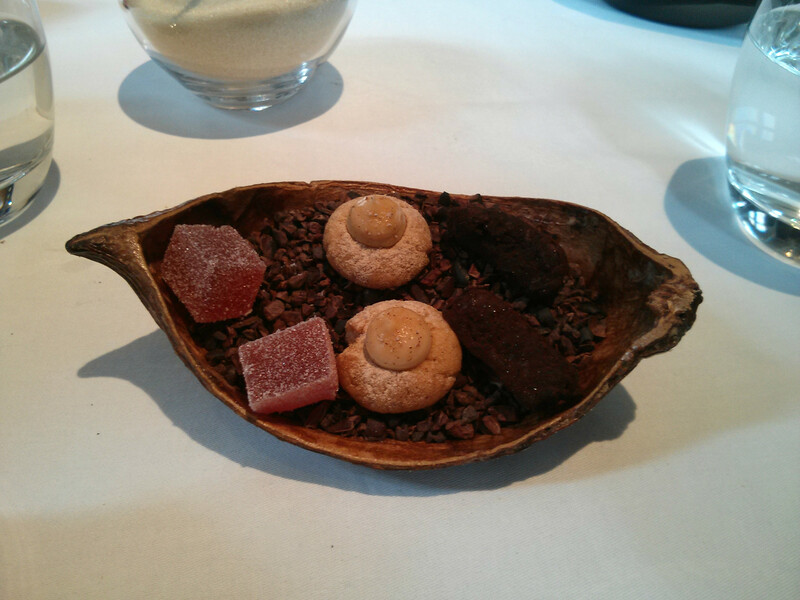 We also tried some great sourdough and a tiny malt crystal loaf baked in what looked like a tiny flowerpot. 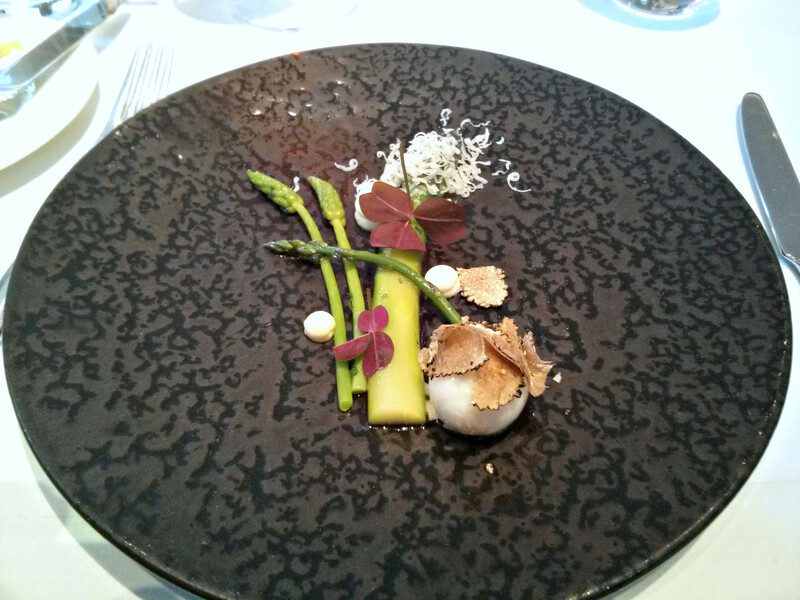 The amuse bouche was a generous plate of English spring asparagus and wild asparagus with truffle and a warm quails egg. I've not tried wild asparagus before, slender stems with a more subtle taste than the cultivated variety but equally delicious, all partnered well with the warm quail yolk. First course was a ceviche of scallops overlaid with a wafer thin turnip disc, seaweed oil with a frozen English wasabi snow dusting the dish. These were lovely fresh scallops and the English wasabi snow providing a lovely kick and intense flavour, similar but far more refined than the green artificial wasabi found elsewhere. My wifes were similar, but shaving of radish were used instead of scallop, with the addition of some celtic mustard. 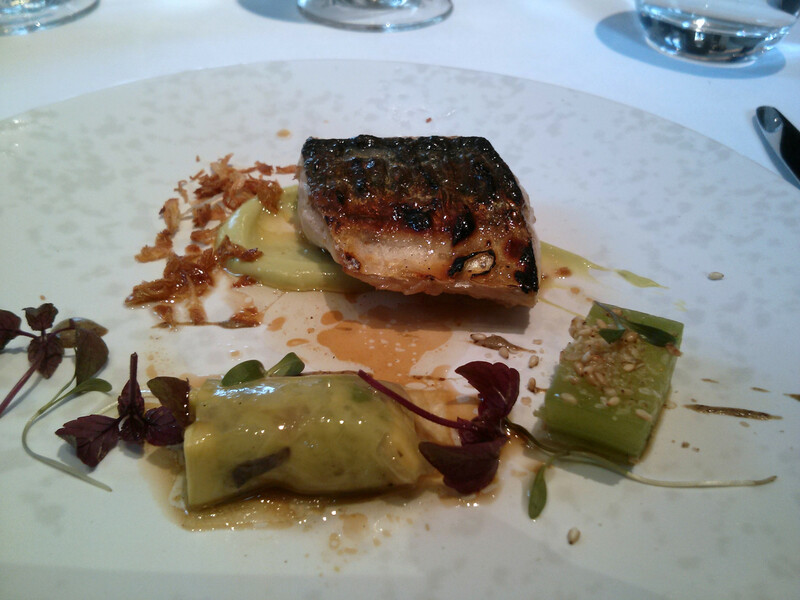 Second course was a signature dish, a fabulous flame grilled piece of mackerel, pickled cucumber and shiso. The mackerel was outstanding, and the accompaniments perfectly matched with the fish. 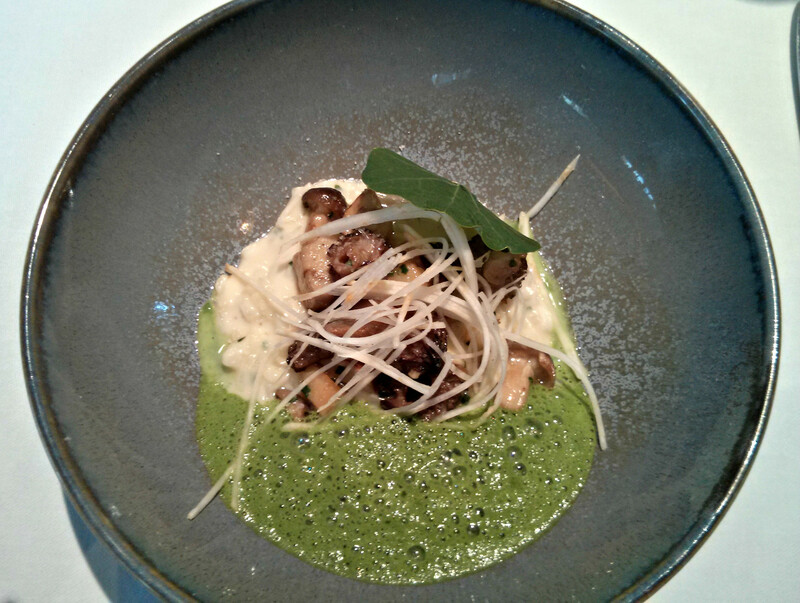 My wifes second course was an excellent risotto of celeriac, creamy and rich with mushrooms , celeriac shavings and a flavourful parsley emulsion. We both had a similar course next, and one I was looking forward to. A bowl of Hampshire Buffalo Milk Curd with a small piece of leek and mushrooms was set before us, and into this was poured a consomme of grilled shallots for myself, and grilled ceps for my wife. In addition to this, on a piece of bark were 2 slices of toast topped with melted Saint Nectaire, truffle mayonnaise and truffle gratings. 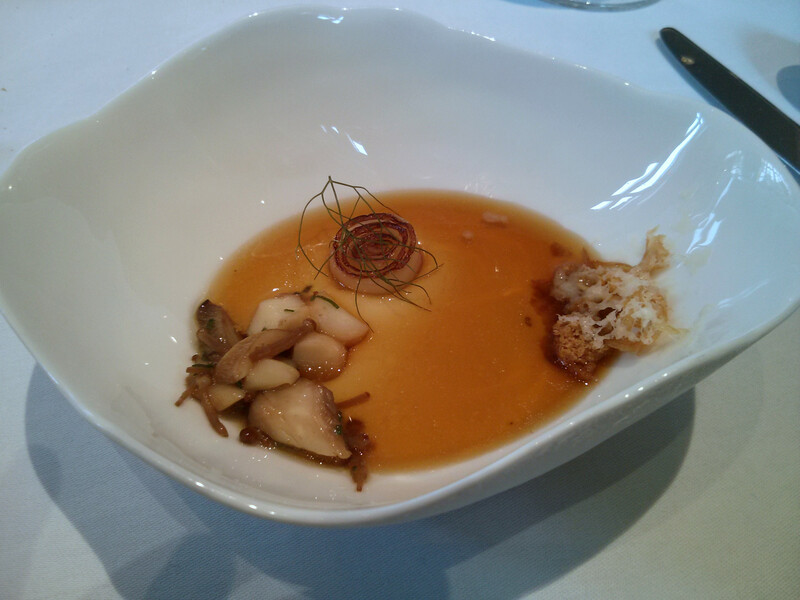 This dish was amazing, the curd and mushroom pieces were delicious, but the consomme was unbelievably good, intense with a grilled shallot flavour. 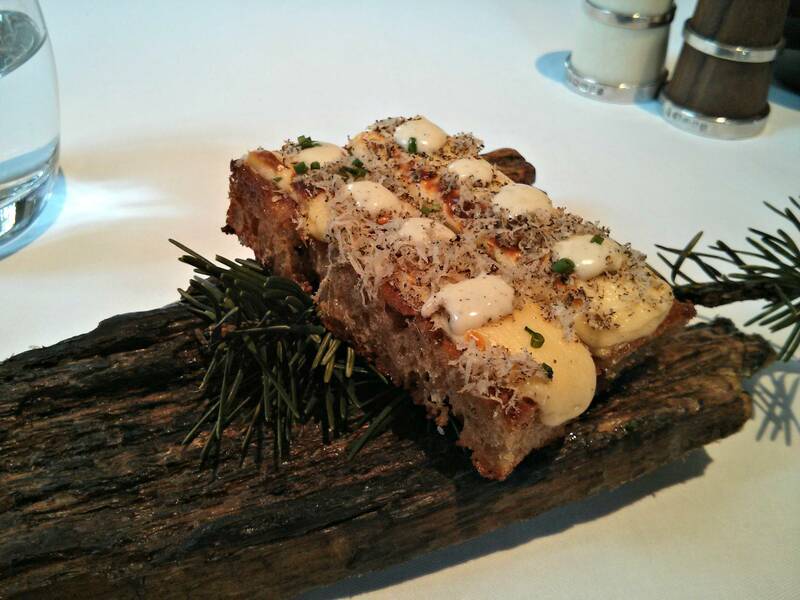 The toast was absolutely divine, flawless bread, perfectly melted silky cheese with the heady earthy truffle. The curd and consomme on its own this was would have been a fantastic dish, but the cheese on toast accompanying it escalated it the dish to stratospheric heights. No visitor to The Ledbury should miss this. A turbot dish followed, this was a perfectly cooked piece of turbot, topped with black quinoa, cooked so it had a crunchy bite to it. Accompanying this was a wonderfully soft and well flavoured broccoli stem with crab, and a butter with Indian spices. My wifes dish was similar, foucsing on the stems paired with a natural yoghurt with the quinoa and some crisps providing texture. This was a delicious course, the Indian spices and butter adding tons of flavour without overpowering the excellent key ingredients. The next course was a picturesque baked Crapaudine Beetroot dish for my wife, this is variety of beetroot with an unusual aromatic flavour. 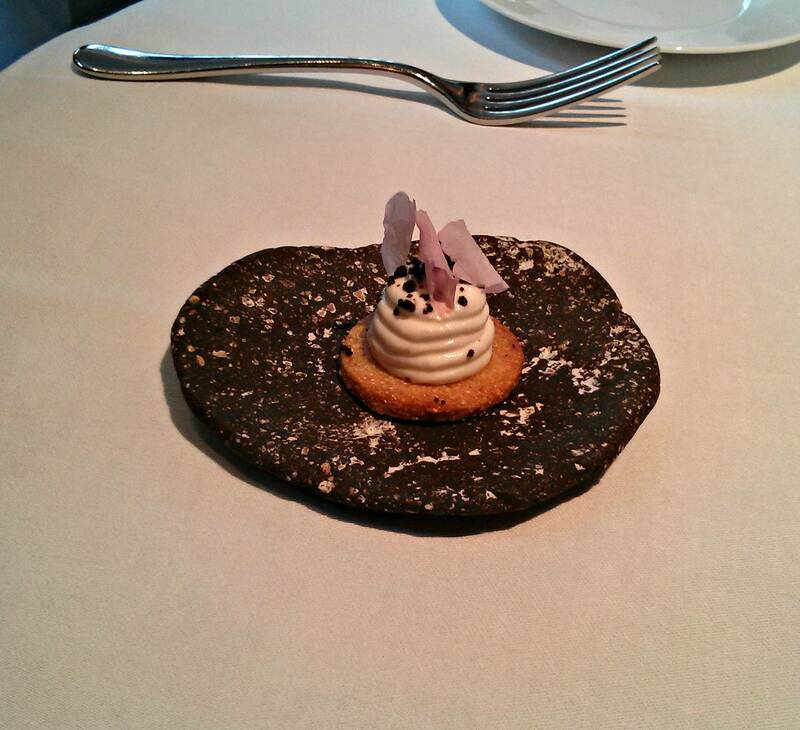 This was accompanied by red leaves, pumpernickel and a cherry blossom, winter and spring on a plate. My dish was first presented by the waitress, a hunk of pork jowl cooked sous vide with star anise and other spices. This was taken away to be plated. It returned with parsnip and pear and walnuts. This was incredibly tender, and intense with the spices, it went perfectly with the fresh bites of pear and sweet parsnip. 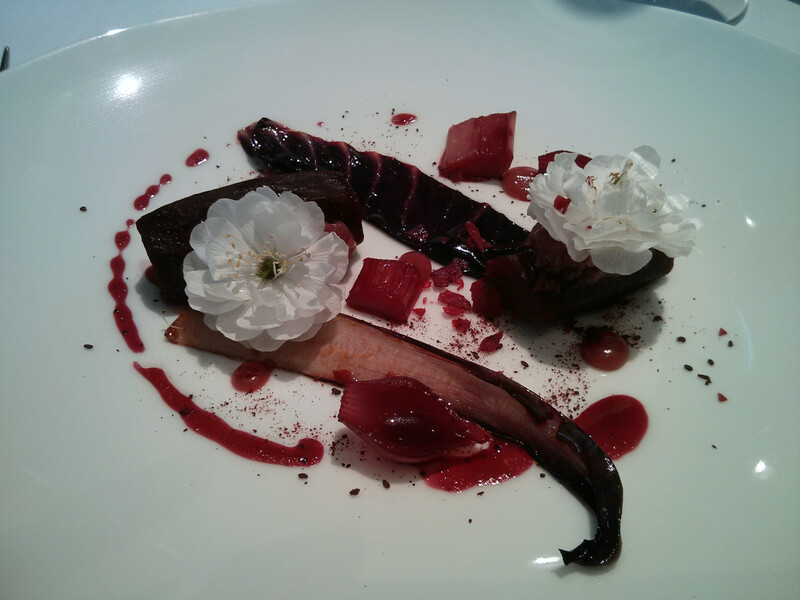 The final main course was a venison dish, Muntjac with Red vegetables and leaves, bone marrow and cherry blossom. The venison came in a few forms, the loin, a finger of fillet and a sausage of venison. This was a truly exception dish, fantastic venison seasoned to perfection and matched with sweet and tart vegetables. The venison was one of the best i've had, tender and well flavoured. 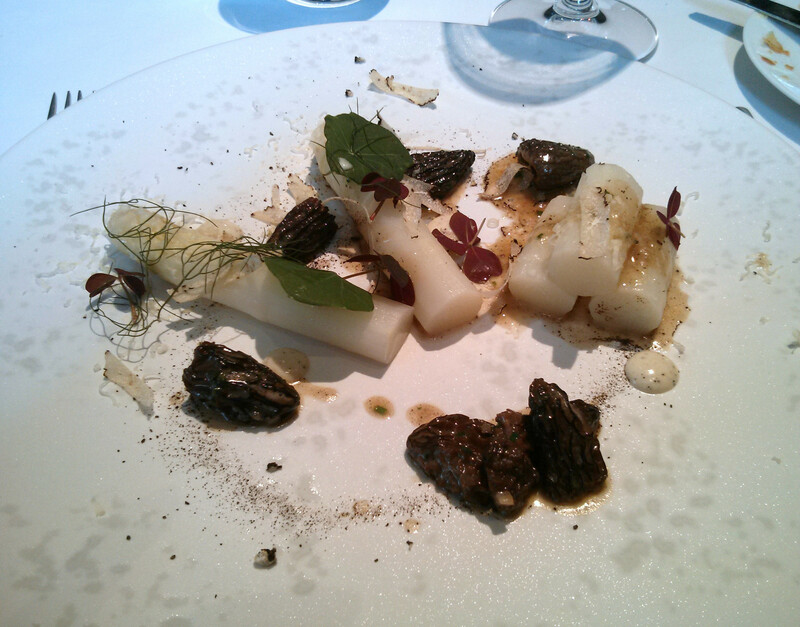 My wife had a dish of white asparagus with morels. cooked in Earl Grey tea, the tea and bergamot flavours were subtle and did not overpower some excellent asparagus, the morels were really good too. Having had some good sized portions, we skipped the cheese course. 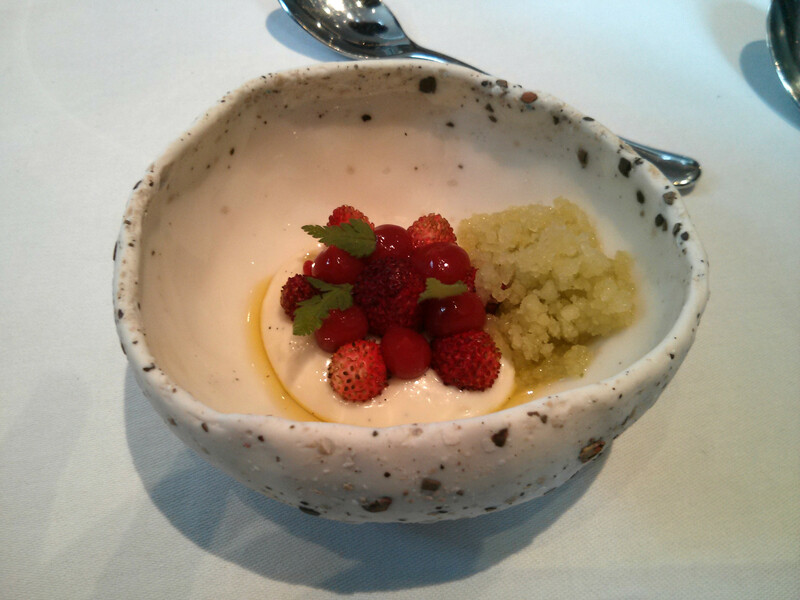 Pre-dessert was a small bowl of honey and thyme cream with some exquisite little wild strawberries, this came with an olive oil and sweet cicely granita. Dessert itself was a slice of brown sugar tart, with poached grapes and stem ginger ice cream. 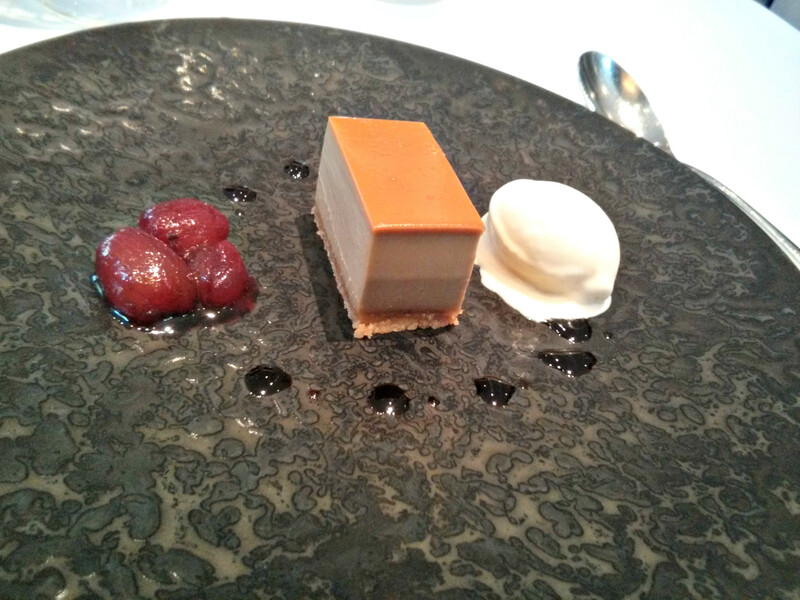 Top quality pastry work here, the brown sugar tart creamy and with a burnt caramelised note and worked really well with the grapes providing a burst of flavour and the ginger ice cream having an intense flavour. I loved this, although not a visually complicated creation found in starred patisserie focused on exceptional taste which it provided in bucketfuls. I was tempted to order seconds. Coffee came with some petit fours, a ganache, passion fruit jelly and a lovely delicate little biscuit that was as light as a feather. The bill came to £320 and included 2 glasses of white, a Grüner Veltliner, and 2 reds, Le Soula Rouge, recommended by the Scottish sommelier. Service was excellent, warm and personal and note remotely stiff or over-formal. The Ledbury is not somewhere you will easily get a booking at short notice, full for months ahead and for good reason too, it's a restaurant whose global reputation is well justified, we had a fabulous long lunch and some truly outstanding food. Open up your calendars, flick forward a few months and pencil in a day, you won't be disappointed. Shaved Radishes with Seaweed Oil, Celtic Mustard and Frozen Horseradish. Ceviche of Hand Dived Scallops with Turnip, Seaweed Oil and Frozen English Wasabi. 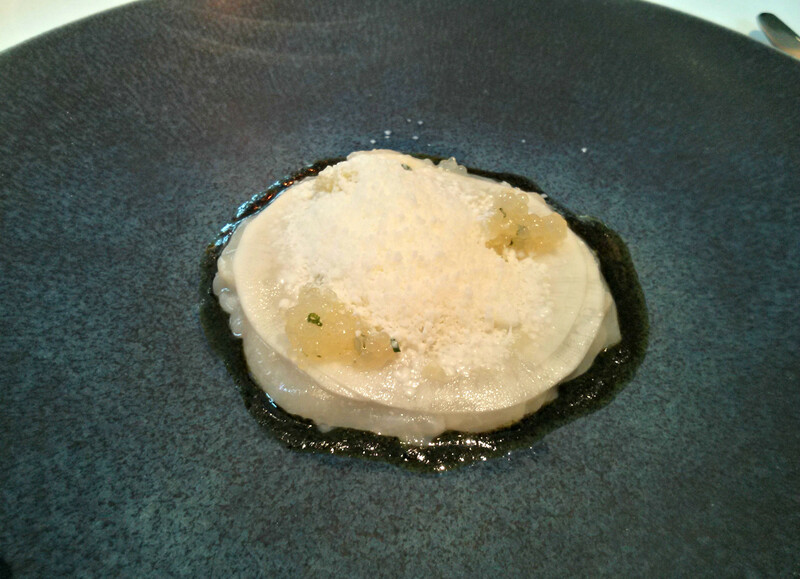 "Risotto" of Celeriac with Spring Truffle and Parsley. Flame Grilled Mackerel with Pickled Cucumber, Celtic Mustard and Shiso. Hampshire Buffalo Milk Curd with Saint Nectaire, Truffle Toast and Broth of Grilled Shallots. Broccoli Stem with Natural Yoghurt and Indian Spices in Brown Butter. 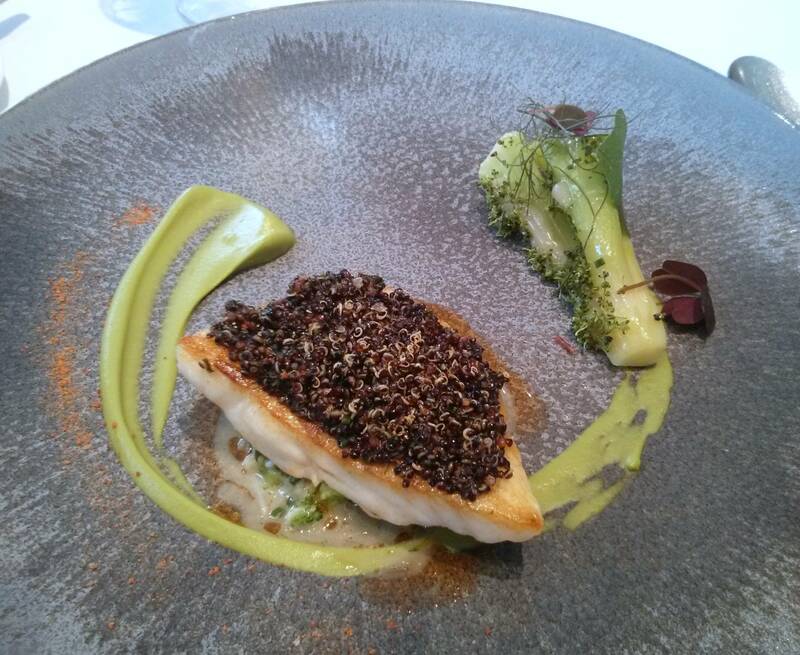 Cornish Turbot with Broccoli Stem, Crab and Black Quinoa. Baked Crapaudine Beetroot with Red Leaves, Pumpernickel and Cherry Blossom. 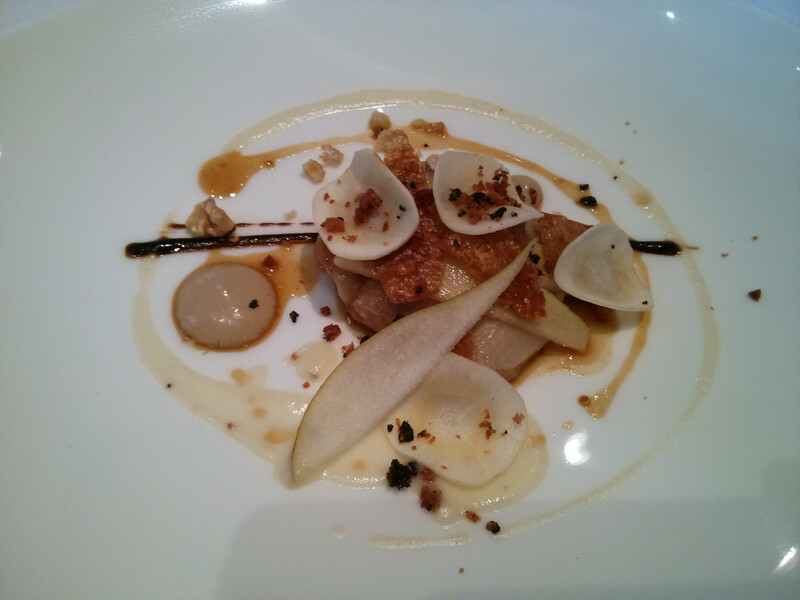 Jowl of Pork with Parsnip, Pear and Walnuts. White Asparagus with Morels Cooked in Earl Grey Tea and Parmesan. 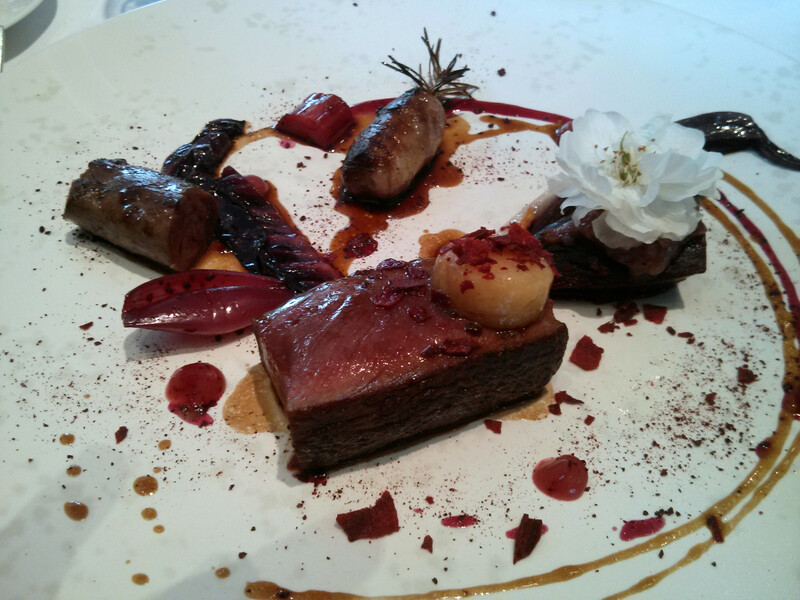 Loin of Muntjac with Red Vegetables and Leaves, Bone Marrow and Cherry Blossom. Olive Oil, Honey and Thyme Cream with Wild Strawberries and Sweet Cicely. Brown Sugar Tart with Poached Grapes and Stem Ginger Ice Cream.